This section describes how to get started with SuperWEB2. 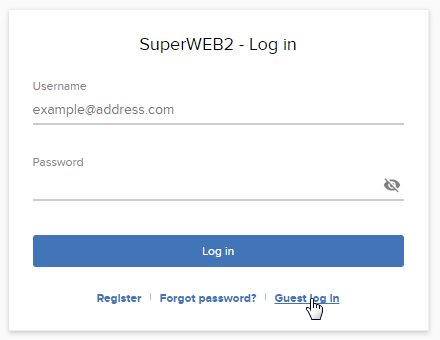 It shows you how to login to SuperWEB2 and start viewing and creating tables. SuperWEB2 is a browser based application. Your system administrator will provide you with a URL or link for your SuperWEB2 installation. The first step is to click the link that has been provided to you, or open your web browser and enter the URL in the address bar. If you have been given a username and password, enter the details and click Log in. Guest users cannot save tables, and may only have access to a subset of the datasets installed on the server. If you do not see this option then this means your administrator has disabled guest access. If neither option is available and do not have a username and password, contact your system administrator to obtain access. 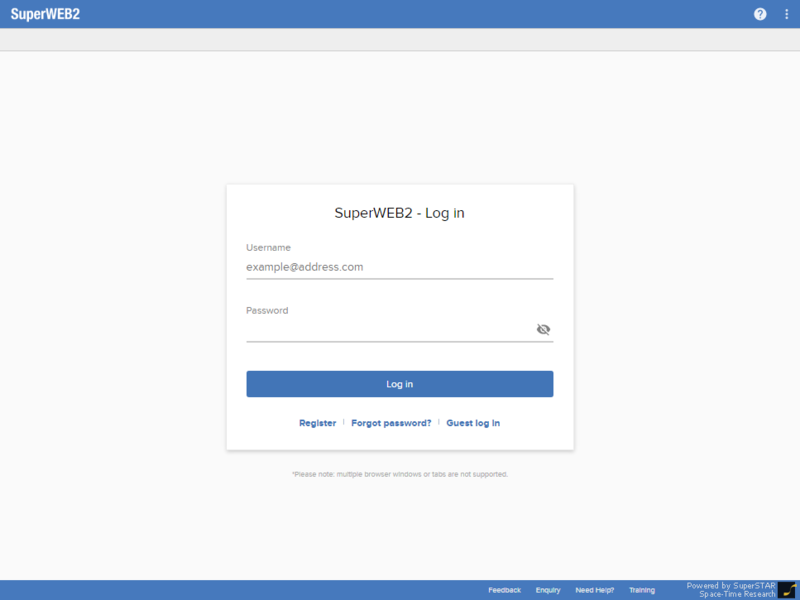 SuperWEB2 displays an error message if you enter the wrong login credentials. If you do this more than a certain number of times, your account may become locked. If this happens you may need to contact your system administrator to have your account unlocked (this depends on how your system has been configured; it is also possible that your account may become unlocked automatically after a short period of time). 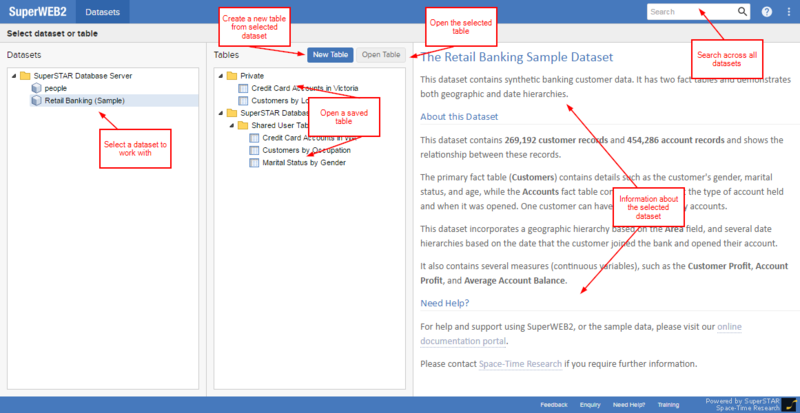 Once you have logged in, SuperWEB2 displays the catalogue of available datasets. This list shows all the datasets that you have access to. Click a dataset to select it. SuperWEB2 will show more information about it in the area on the right, as well as a list of any saved tables for this dataset. 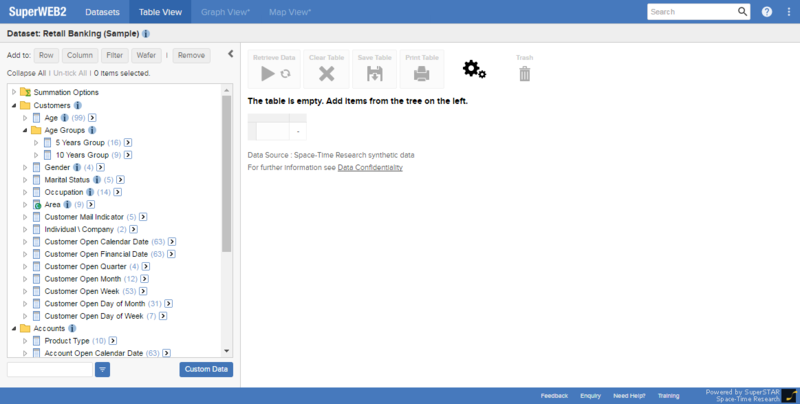 Double-click a dataset to start creating a new table. This list shows all the saved tables for the selected dataset. The tables in the Private folder are accessible only to you. 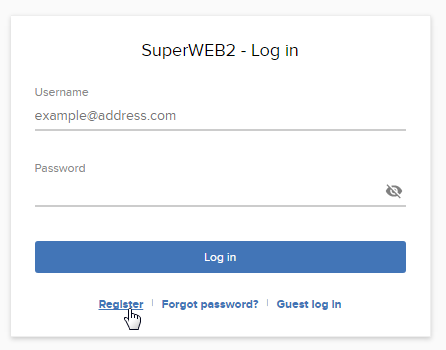 Other tables (either those you have previously created, or created by other users) may be accessible to other SuperWEB2 users, depending on how your administrator has set up the permissions. 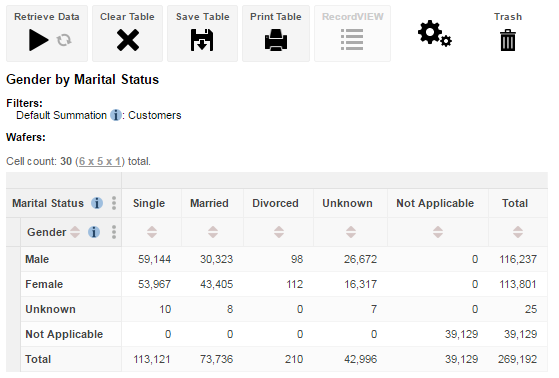 Double-click any of the tables to open them, or click New Table to start with a new, blank table. (Only displayed if the dataset has a default table configured). 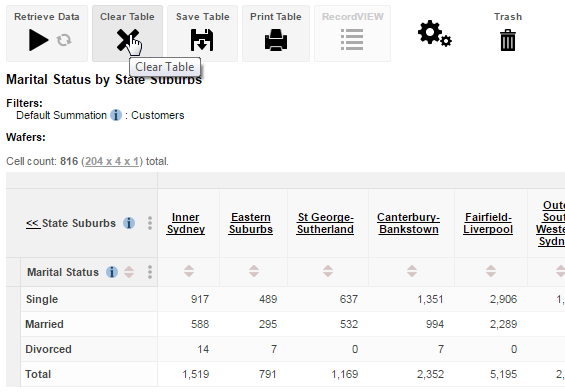 Click to open the default table for the currently selected dataset. 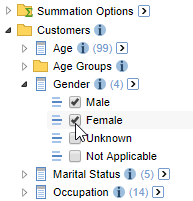 Your administrator may have configured a default table for your datasets, and may also have designated some fields as "mandatory fields" that will be added to the table by default. 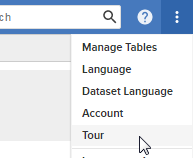 Depending on the exact configuration, the default table may open automatically even when double-clicking to open the dataset. 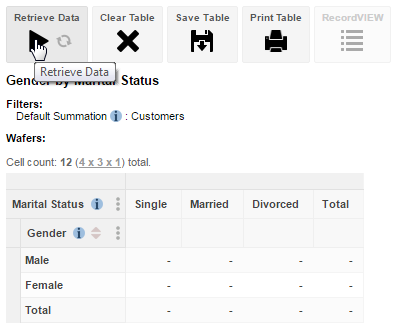 Click to open the currently selected dataset and start creating a new table. Click to open the currently selected table. This section shows more information about the currently selected dataset. Use this to search across the saved tables and datasets. 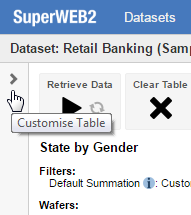 If you hover the mouse pointer over a dataset or table in the list, SuperWEB2 will display a tool tip showing the full name. This can be particularly useful if you have saved tables with very long descriptive names. Locate and open the dataset or table you want to work with. The rest of this section uses examples from the sample Retail Banking dataset. 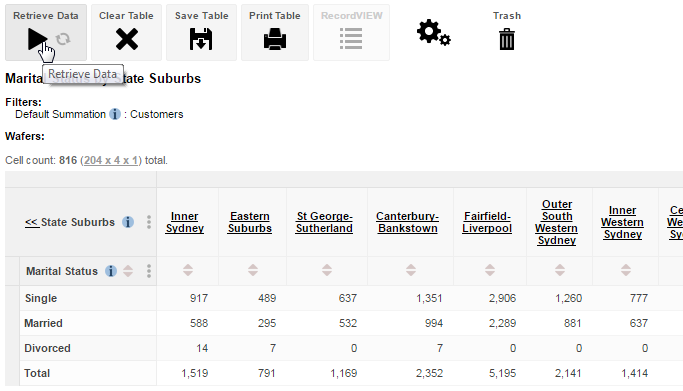 Once you have opened a dataset, SuperWEB2 displays the Table View, where you can build and modify tables. The section on the left shows a list of available fields and field values that you can add to the table. The area on the right is where your table displays. 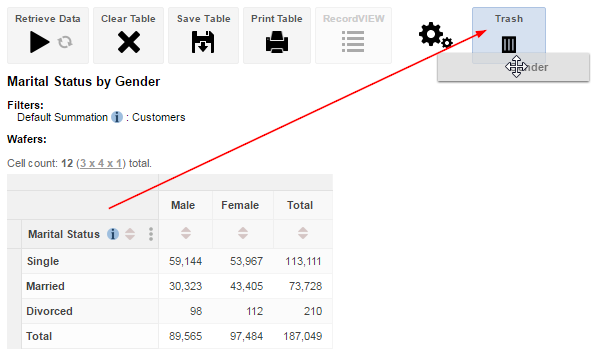 Unless you selected a saved table, this area will usually not contain any fields when you first open a dataset. The exception to this is if your administrator has configured mandatory fields or a default table, in which case these may be added to your table by default. 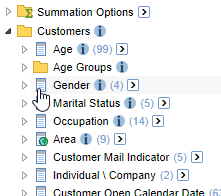 You can add other fields to the table, but depending on how your system has been configured, you may or may not be able to remove the mandatory fields from the table. 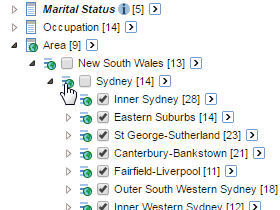 Go to the tree on the left (click the arrow to expand the customise table panel if you do not see the tree). This is where you select the fields you want in your table. Items in the list have different icons depending on whether they are folders, fields or field items. When you add the first field values to the table, SuperWEB2 also adds the default summation, so that your table has something to measure. Typically the default summation will be something like a count. 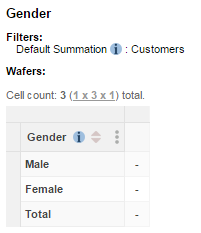 For Retail Banking the default summation option is to count the number of customers. 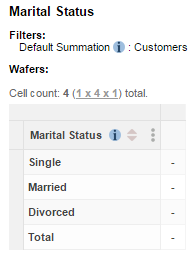 Next we will add the Marital Status field to the column headings. This time, as an alternative to selecting the values we want, we will use a shortcut: you can quickly add all the available values in a particular field just by dragging and dropping. In this case we want to add this field to the columns. Drop the field onto Column. Now that we have created a basic table, there are a number of changes we could make. The following are just some examples. 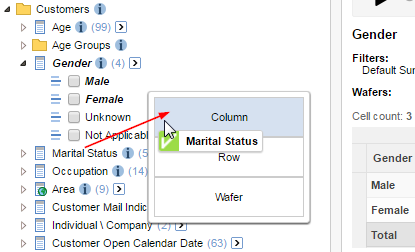 Suppose we have decided that we do not want to include all the values of the Marital Status field in the table. We can use the tree on the left to remove individual field values. 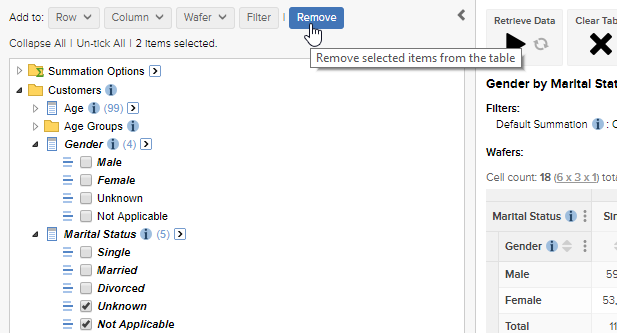 Select the check boxes for the values you want to remove from the table (for example Unknown and Not Applicable), then click Remove. SuperWEB2 removes these values from the table. Suppose you want to swap the columns and rows. 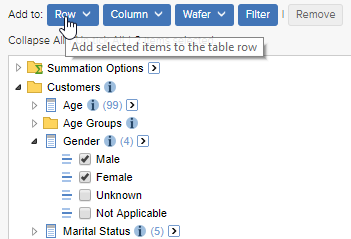 Simply drag and drop the field names from within the table. Another way to add a field to a table is to use the Select all at level drop-down list to quickly select a large number of field values. This is particularly useful for hierarchical fields where you can choose to select all the items at a particular level in the hierarchy. 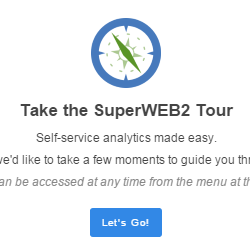 SuperWEB2 will prompt you to confirm that you want to delete the table. Another way you can quickly select multiple field values is to use Shift-click. This will select a range of field values. You can then either double-click the table you want or click once to select it and click Open Table. The dataset name at the top of the screen is also a clickable link. 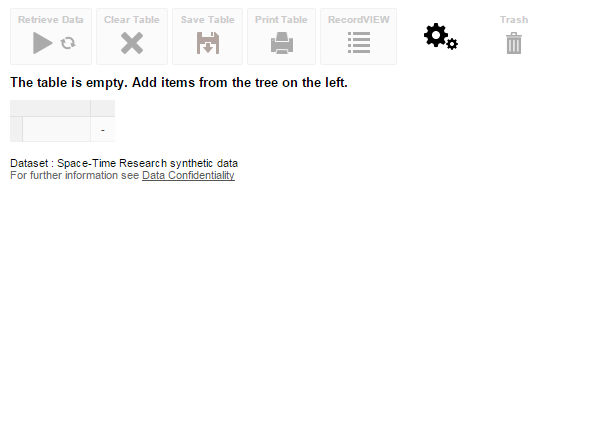 You can use this to return to the dataset's info page on the catalogue screen. In addition, if you opened a saved table, the table name will be displayed in the top bar too; this is also a link back to the catalogue. 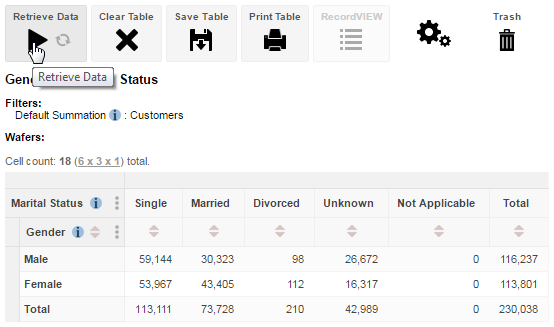 Switching to another dataset or table will clear the current table. If you think you might want to use the table you were working with again, you may wish to consider using the save table feature. Learn about adding totals and viewing percentages. 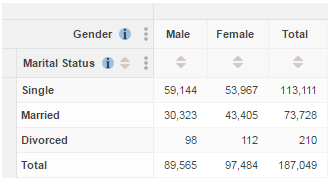 Learn about the different ways you can add multiple fields to a single axis. Learn about the available summation options. 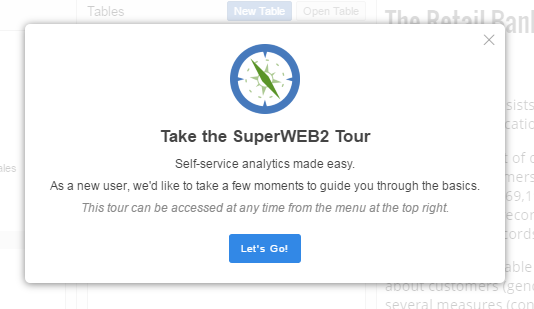 Save the table and then reload it the next time you use SuperWEB2. Visualise the table results by creating a graph. See geographical data from your table on a map. 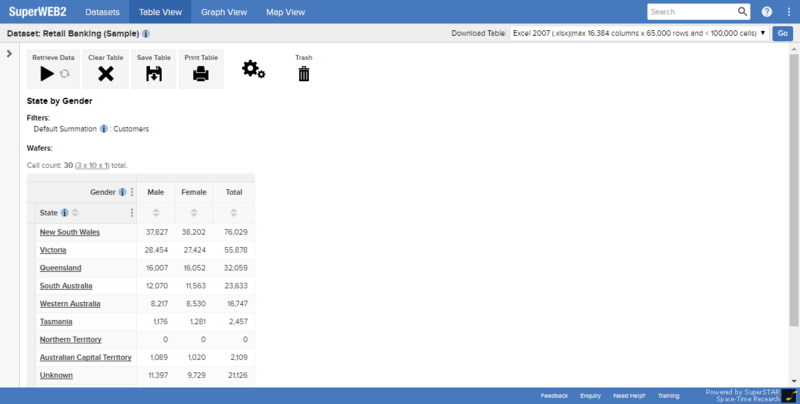 Explore individual unit records, with the Record View feature (if available on your deployment).